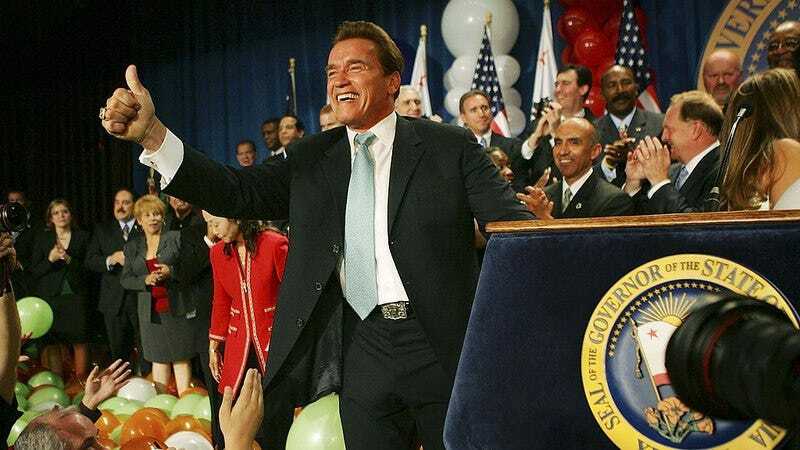 Having been born in Austria, Arnold Schwarzenegger can never be President of the United States of America. That is, unless President Trump decides to change that rule after he’s gotten rid of those other branches of government, which seems unlikely, frankly, given their recent public feuding. Still, the now-former Apprentice host continues to troll his slightly older, significantly oranger counterpart by following in his footsteps, pondering a return to politics as a member of the U.S. Senate. The news of Schwarzenegger’s potential 2018 Senate run, which has since been picked up by a number of outlets, originated with a report in Politico, which cites “several GOP political insiders in California” who are reportedly super pumped about the idea of having the Total Recall and Last Action Hero star as their future Seninator. Wait, no. Senantor? Senator? Crap, that’s just the regular word. Whatever. Anyway, word is that Schwarzenegger might run as an independent, building on his recent criticisms of both major political parties and campaign to end gerrymandering. (In a video released on Facebook last month, Schwarzenegger said “both parties are incredibly skilled at screwing over the voters and keeping them in the dark about their trickery.”) It would also appeal to what Politico calls his “intensely competitive” nature, and desire to use Trump’s thin skin to build his own political capital. “In politics after Donald Trump, nothing is crazy any longer. We’re in the third dimension here,’’ GOP political consultant Luis Alvarado says. “Arnold Schwarzenegger, who actually has more political experience than Trump, would certainly seem to fit a mold to what some of the electorate would find attractive.” Of course, Schwarzenegger left office as governor of California at the end of his second term with a near-record low 23 percent approval rating, which bodes poorly for his future political prospects. Or at least, it would have, in a pre-Trump America. Now, all he’s got to do is bring a ferret to the Senate floor, and everyone will be having fun again in no time.